I used to be obsessed with eating macarons, and when I first saw a video on how to make them, I was super intrigued. I started reading more about how to make them and found so. many. websites. A lot of websites were dedicated to trouble shooting, and I quickly realized these things must be tricky to make. Every time someone has a macaron I make and they ask me about making them I always note how many tears went into making them. The first time I made them, I really had no idea; they were pure sugar and butter and looked terrible. They’re somewhere on my Instagram if you really want to search for them. The next time I ended up making them, I found a video talking about making them and using the Italian method. Started doing my research, and that’s honestly where I discovered all the different types of meringue. I have found that the first time I made them the French way, which I I’d be able to do now.The Italian method has worked really well for me, though, so I’ve stuck to that. I made macarons 5 different times until I actually had a sense of what I was doing. The third time I was so discouraged because I had so much confidence going in. I literally thought, “Third time’s a charm,” and for some reason I thought that was truth… why would I ever? No, so much sadness went into these delicate little cookies and some very short, aggressive sentences towards my gentleband. Now, I don’t ask for his help and I can make a batch, no problem. I want to say whip up a batch, but honestly I don’t think you ever whip up a batch of macarons. If someone does, let’s talk because I must be doing something wrong still. There’s some equipment items I think I could purchase myself to make my life easier, but I just haven’t justified it for this one cookie. This flavor is one of my good friend’s favorite flavor combinations. She’s getting married soon, and since her bridal shower was coming up, she requested these! I hadn’t made them in awhile, because if I haven’t said this recently, I’ve been working (broken record over here). 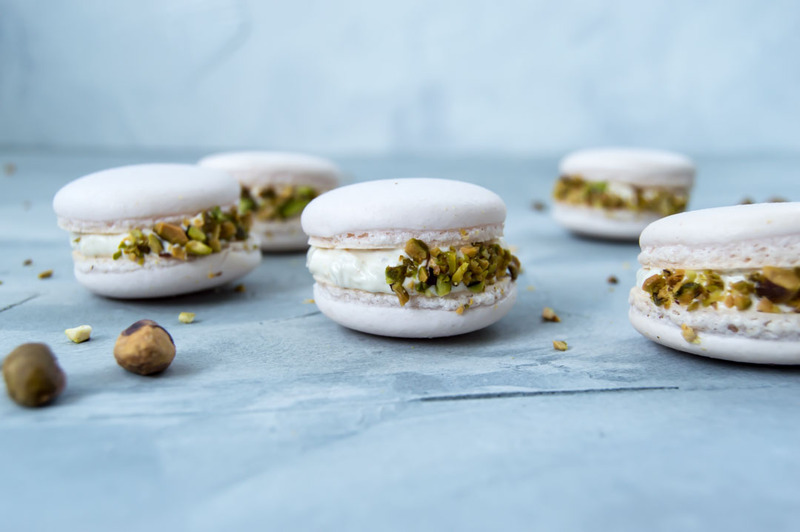 I had never made this flavor into a macaron, so I was interested in how exactly to put rose and pistachio in it. 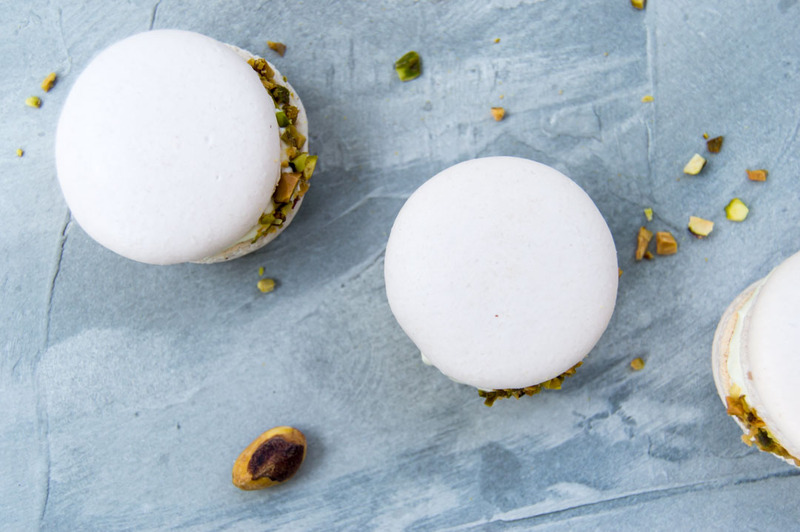 I had decided on adding rose water into the shell and folding pistachios into the buttercream. The other unique thing I did here was make Swiss buttercream. I don’t like American buttercream, it’s so icky sweet! I like making baked goods, but I truly do not like things overly sweet! I have come to love Swiss buttercream and it’s honestly so easy, I’ll be sharing that recipe along with the macaron recipe. 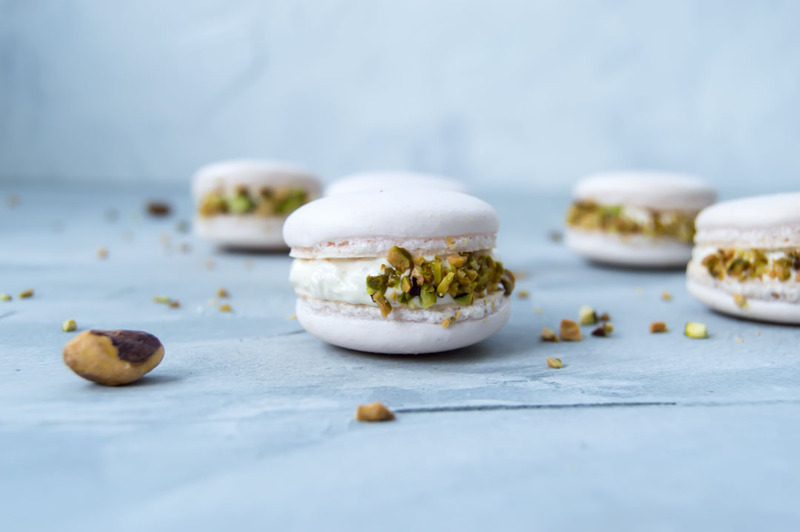 After I had piped the buttercream, in I sprinkled some more pistachios in the middle, put the top on and just felt like it needed more. 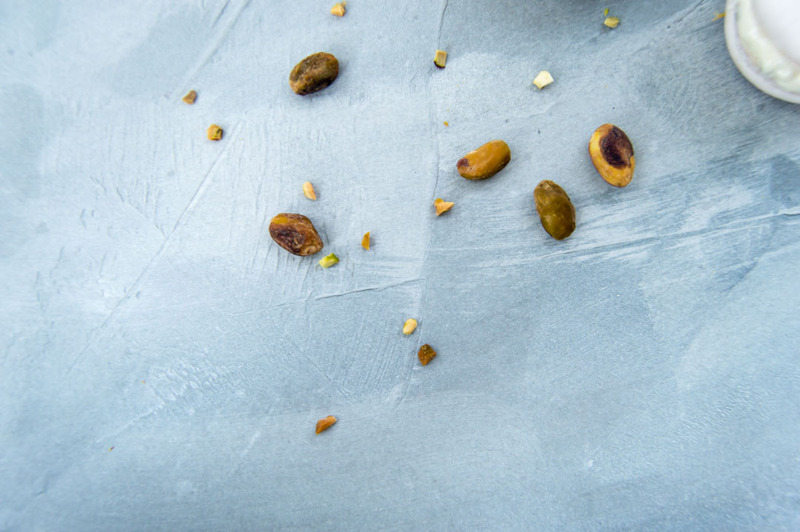 I dipped one side into crushed pistachios and I was like yes, that’s what it needed. Macarons are just so beautiful, fancy, and DELICATE! red food coloring, I use a natural one made with beets. ∙Once you achieve stiff peaks, place your rosewater in and make sure it gets mixed in well. ∙I slightly colored these with natural pink food coloring. It’s made out of beets and it’s a gorgeous red. I used 2 drops to get that very pale color. ∙if you hold your spatula up, and it ribbons off and dissipates into itself in 10 seconds, you can stop folding; you’re ready to pipe! ∙If your mix looks like it has turned to liquid or curdled, don’t worry, just keep whisking.